The Two of Cups symbolizes compatibility, attraction, connection, mutuality, love, bonding and agreement. It is one of the most clearly expressive cards in the whole Tarot deck. The image of the man and woman powerfully coming together to share goblets is highly familiar to us, whether it be for a date, marriage, a contract or ritual. All of our modern movies still have the archetypal image of man and woman running together in passions as though there is a magnet between them. The card is very easy to interpret in the sphere of romantic inquiries, for in a very straightforward manner it symbolizes mutual attraction, romantic interest and affection. It is an image of cooperation and equality and mutual encouragement. Each figure “puts his heart out there” for the world to see, and each figure receives the heart of the other in perfect balance. You are generous and warm to others and likely feel well-received and easily understood in return. 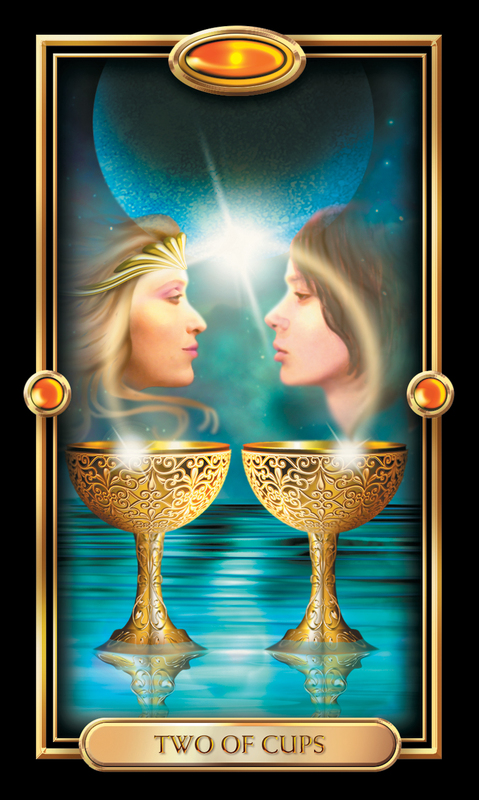 It is hard to ignore the similarity of the Two of Cups to the Lovers card. Yet, like the Lovers card, the two of Cups does not only indicate romantic relationships, but relationships generally, with one or both sexes involved, as well as the more abstract concepts of balance, mutuality and union. Specifically this card represents the beginning of a relationship— romantic or platonic in nature— or an initial moment of commitment or connection. It may symbolize a marriage proposal or other milestone where the relationship is reaffirmed or taken to a new level, a new collaborator or team at work, or a “coming together” of forces that are not literally (or exclusively) people. It may be that through following your joy or yielding to your attraction, many disparate elements will coalesce and come into balance, which furthers you in your ultimate aim. It may even be symbolizing balance or cooperation between different aspects of your personality, or advising you to find greater unity or harmony among your thoughts, words and actions. In general this is a highly positive card, indicating a happy time when cooperation, reconciliation and sharing come naturally and effortlessly. The Two of Cups card is connected to Venus (Empress) in Cancer (Chariot). The Two of Cups card represents true love and close relationships in your life. You will likely enjoy a very real intimacy in love, and you and your partner may experience a new level of understanding in your relationship. You may also experience a period of healing in your relationship due to this increased level of connection and understanding. You may also discover friendship at work and realize you love your job because of the people you work with. When the Two of Cups card is reversed, it can indicate that you may have a fear of love or relationships. While you may long for love in your life, your fear of rejection and abandonment may be getting in the way of a fulfilling relationship. If you are in a relationship, you may experience some distance or a miscommunication that causes conflict. The Two of Cups card can represent comfort and appreciation in your work life. You will likely be shown appreciation for your hard work and feel comfortable in your career. If you are looking for a new job, it is possible you will find what you are searching for soon. The Two of Cups card represents true love, balanced partnership, commitment, and hope in your love life. You may have all the components of a solid, loving relationship in place, but you may still need to put effort into keeping your relationship strong and fulfilling. If you are looking for love, you may just need to relax and enjoy whatever comes your way. The Two of Cups card can indicate balance and fairness in your finances. You will likely find that while you may not have reached all of your financial goals, you feel comfortable and have enough to meet all of your obligations. The Two of Cups card can signify connected energy in your spiritual life. You may be feeling extremely connected to the universe and its energy. You are also likely to be feeling more loving in general, and now is a good time to share your love and joy in the world.